Merry Christmas to those who are reading this post and to those who are not. It's Christmas Eve here in Oz so I thought I'd get a quick post in before Santa comes down the gas exhaust flue tomorrow morning. I've taken a rest from my refinery dilemma and am doing some other things including painting my fascia boards. I'd always thought a medium grey for these, but as soon as I'd painted half of them I knew I could do better. Second try was a lighter shade of grey and finally I have settled on a shade that was even lighter and seemed to match the scenery best..
Take home message - the colour of the fascia board will impact on the appearance of your layout and deserves careful thought. By this time tomorrow Xmas will be all over for us here in Oz, but will be just getting underway in Europe and still being dreamed about in North America. No matter what time zone you're I wish you all have a great day. The prospect of snow for us is not looking good for us tomorrow as we have a 31 degree forecast - Celsius that is. I have just seen your thread, it’s taking me ages to read all the threads and the info that goes with them. I have found your layout to be extremely brilliant, having viewed your videos on the cameras, for which i will reply to. 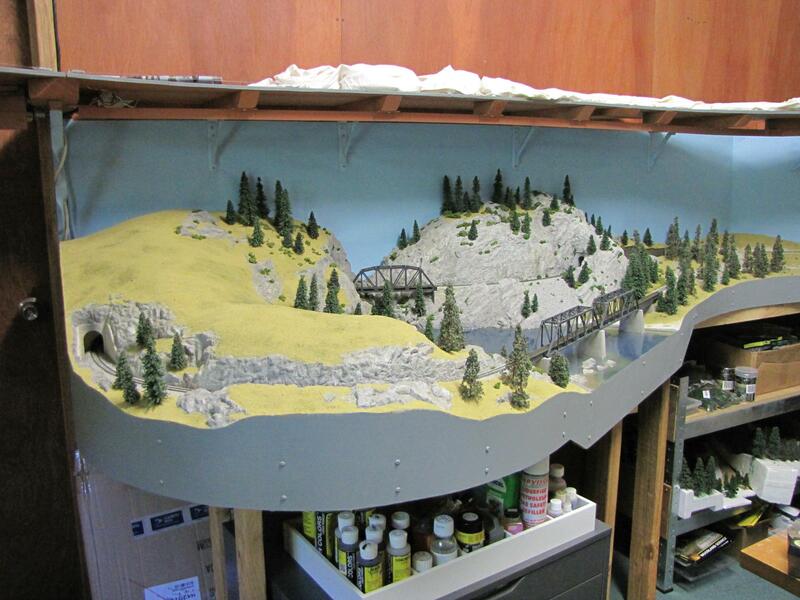 Your scenery is brilliant, i also use foam for my scenery and i find like you that you can add and take away to your hearts content until it looks right, but i have even painted and put trees and stuff on and still i added to and taken away. I suppose it is personal choice. Thank you for a great thread. A progress report from Deadwood. 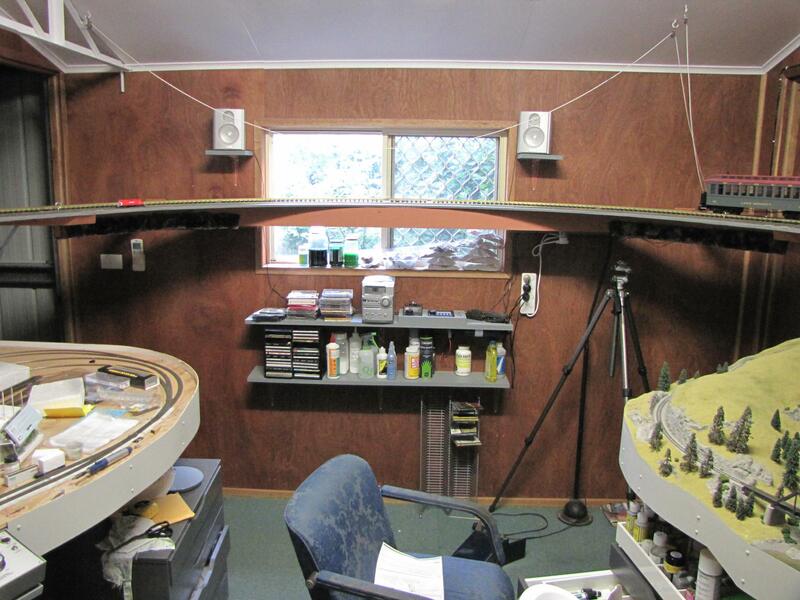 I still haven’t made a decision on the refinery, but have been doing some other things in the meantime including painting my fascia boards, constructing extensive shelf space (still not enough), fitted my CD player, and installing a control station for my upper level track rings. Much of this is all about getting things off the floor and off the parts of my layout that will be under construction soon. Here is a photo showing the CD + speakers installation, some of the new shelving (already filled), and the upper level control station. The section of the upper level platform that the strings are attached to can used to raise that section like a drawbridge if necessary (rarely). 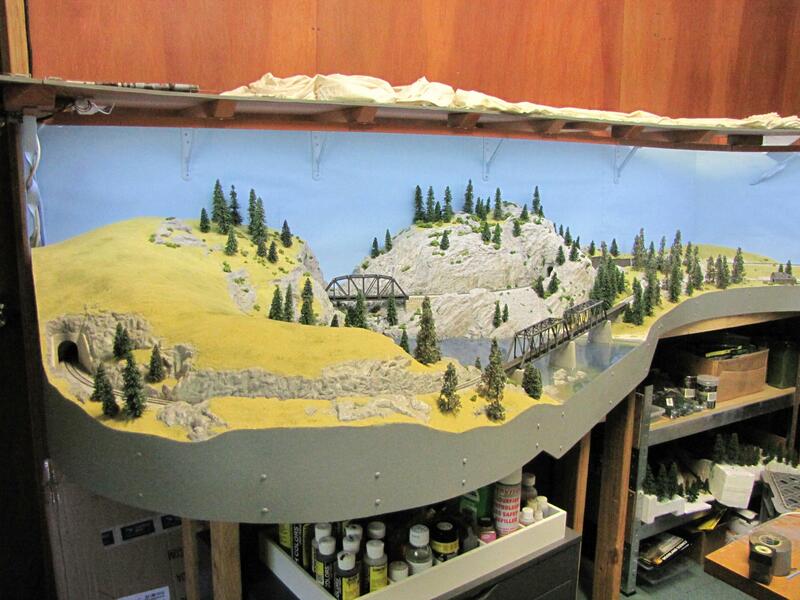 Deadwood in the sky has 3 track rings: a G gauge ring, an HO/OO ring (+ 1 siding), and an N scale ring with 2 sidings. These are what one might call minimalist layouts, but then I enjoy watching trains go round and round (and round and round, and…).. The G gauge ring needs a 10 amp controller, but the other 2 are controlled by an MRC Tech 6 2.0 which can be switched between DC and DCC. Here is my Bachmann White Pass and Yukon Route ten-wheeler going round its track. The real WP & Y R was built in 1898 as a 3’ gauge railroad to carry gold miners between Skagway, Alaska and White Horse, Yukon Territory during the Klondike gold rush. The HO/OO tracks carry several trains including the Rapido ‘Canadian’ passenger train seen in the above video, a Hornby Flying Scotsman train, and a couple of 50-year old Trix Twin locos (Britannia + Class 5) with trains. 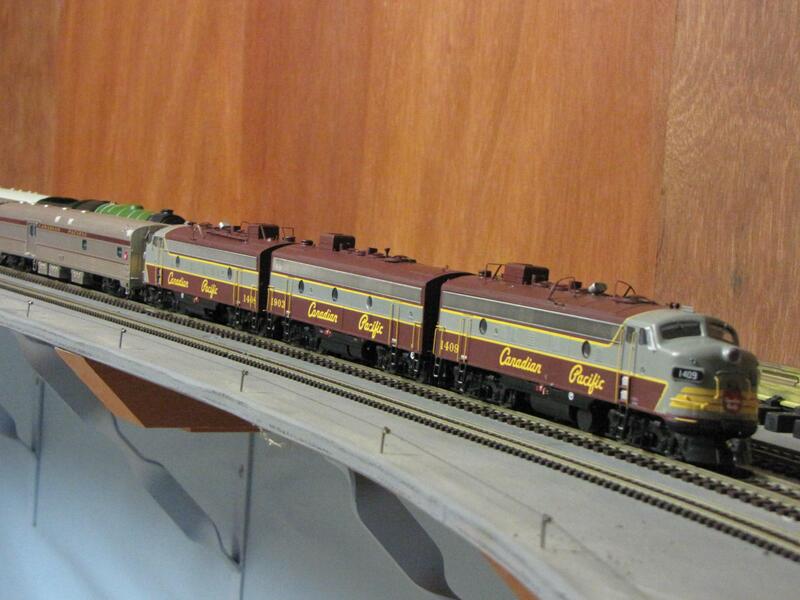 The Hornby loco and coaches are top notch in detail, but the Rapido Canadian really is museum quality. 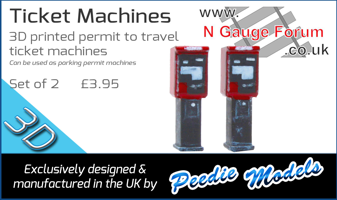 You future Rapido Pendolino owners are in for a real treat. The bars you can see on top of the FP9As are for breaking off icicles in the prototype so they don’t smash the windows of the dome cars. Not exactly N scale. Hope that you’re all off to a good start in 2017. The way you have filmed it with the camera keeping track is excellent. Thanks for the updates and photos. 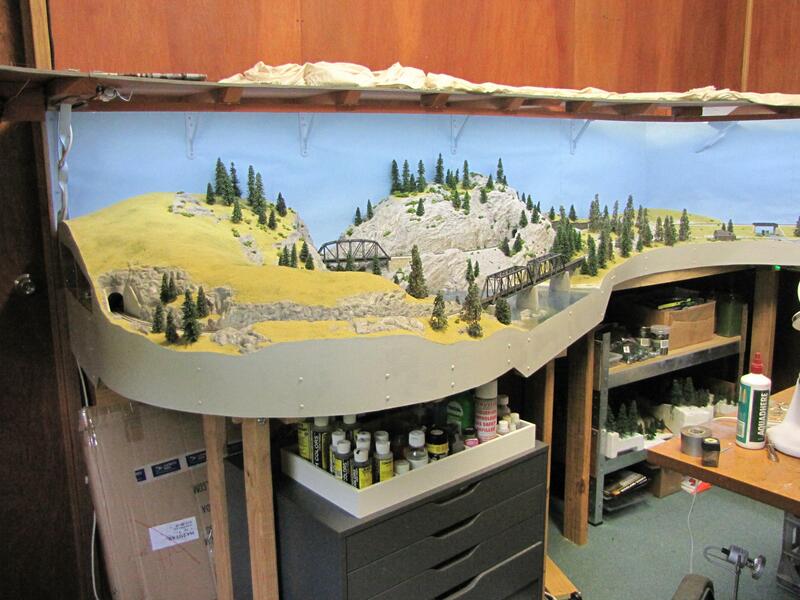 What a great space you have for your model railways and some very interesting and attractive rolling stock to run, too. Nice high level tour of the man cave too. Wow that is a :superb layout: it got my heart fluttering in a nice way seeing and hearing your G train. for posting it and can we have some more please. Not much progress on Deadwood, but I have been beavering away on things to do with it. The major piece remaining on the layout is the right hand (eastern) side which will be centred on town/industrial activities. 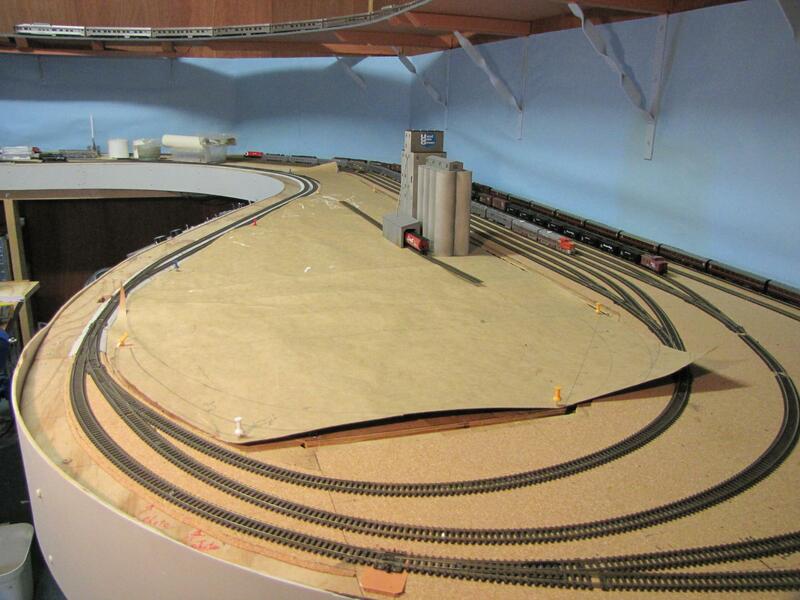 The shape available is sort of tear dropped lying between my fiddle yard and the main line. I haven’t decided on exactly what I want in this space except that it will include a depot building on the main line as well as a spur to a grain elevator. 1. The styrene plastic is not great for taking paint especially acrylics so spray painting with enamel primer is advisable. However, don’t do this with when the air temperature is 38 C as I tried. The paint mostly dried before it hit the surface. 2. Fresh CA cement is good for putting the kit together. Old cement (year +) doesn’t work so well as I found out the hard way. 3. 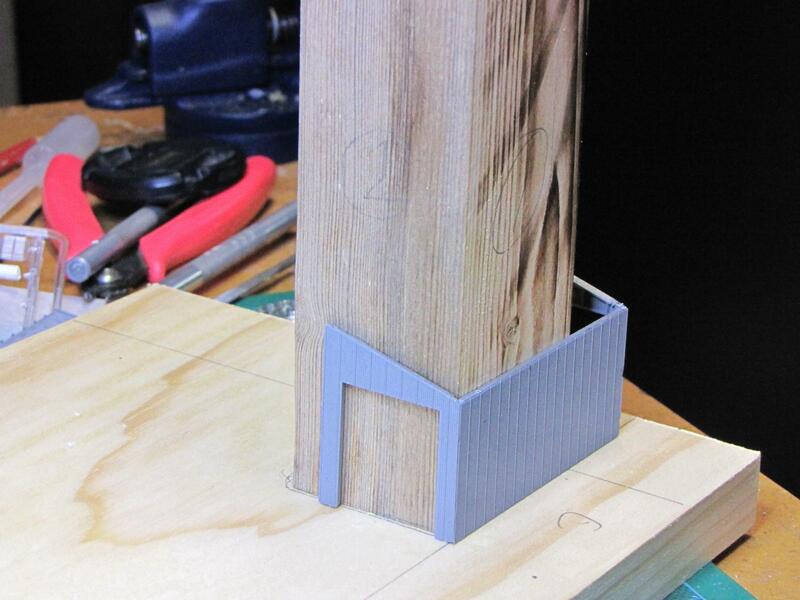 A simple jig consisting of a square sided post mounted on a small flat board as shown below was useful for getting the sides of the building at right angles to each other and vertical when gluing. Overall, the kit is of decent quality. 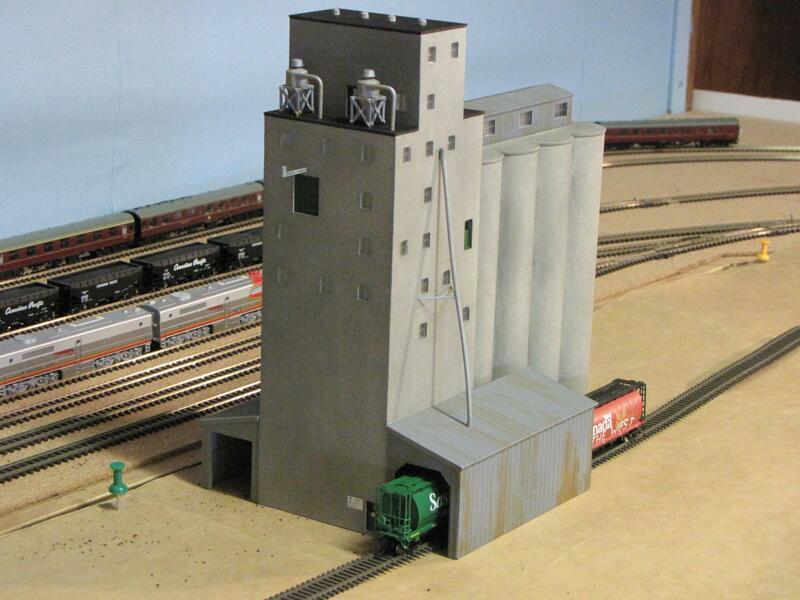 The sides of the elevator building glued together closely with only tiny gaps, but the silo bins were a bit distorted. I glued these as close together as I could but Tamiya filler was required to fill gaps that remained. Walthers suggests that you paint the elevator white to reflect the sun as in the real thing, but I don't ever remember seeing a white one. In my mind, concrete elevators are concrete coloured. Therein lies a problem that others have mentioned in this forum; that is, how to get concrete coloured paint. Woodland Scenics has a concrete colour as part of their road system top coat as well as one of their earth colour pigments. Neither look much like the concrete I've ever seen. The top coat appears to me as light yellow with a brownish tinge. However, I painted this stuff on and it worked very well as a first coat over the enamel primer. Then I sprayed on a dilute solution of Woodland Scenics slate grey until I achieved something that resembled a concrete colour to me at least. Thanks for the detailed update, Webbo. The kit does look good. Re painting the elevators white, here's a link to the Shredded Wheat factory here in Welwyn Garden City, my old home town. Looks great for me and the size of your layout is amazing. Some companies when laying concrete did add colour to it sometimes for customers, i have seen in my time driveways with coloured concrete, but it didn’t really take off here. Please show more has you progress Webbo, really love your layout. 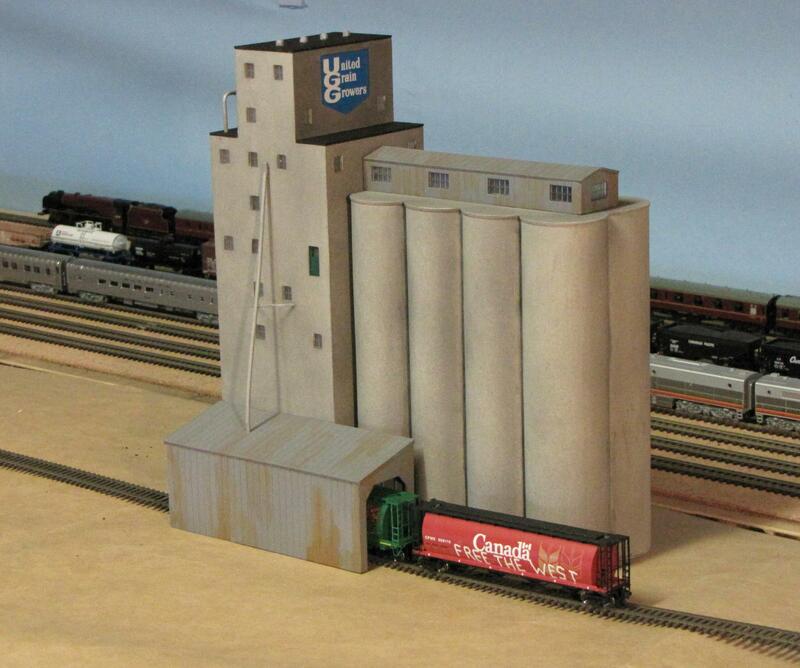 The grain elevator looks very good. yorkmodelmaking.co.uk is in the Google index, but the none of the links work. We will be carrying out planned maintenance work on our website on 1st and 2nd of February 2017. This website may be offline or not function correctly during the update on these dates, we apologise for any inconvenience. Page created in 0.186 seconds with 45 queries.